Want to own an illustrated Bhagavad Gita? How about a Neo-Babylonian cylinder seal? Who wouldn't want their very own piece of Homer? Or, for the person who has everything, an 18th century shaving kit, hidden inside a faux book. The breathtaking top lot of the sale is the Album AmicorumDas Grosse Stammbuch (large image) of Philip Hainhofer, an illuminated manuscript on vellum and paper in German, Italian, Latin and French, 1596-1633 (estimate: $600,000-800,000). 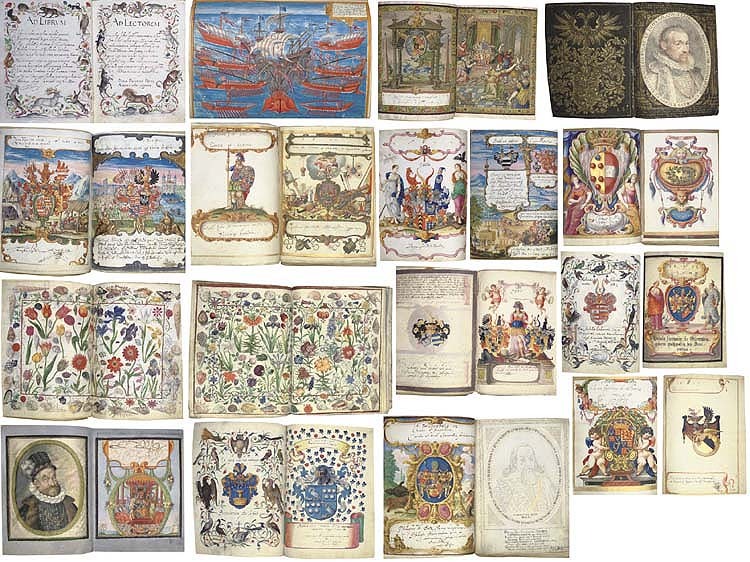 This renowned 'Book of Friendship' is a monument to the princes of Europe and court art. Brought together by Philipp Hainhofer (1578-1647), an internationally influential figure who was employed by the European princes as an art advisor and political agent, the Grosse Stammbuch contains signatures and coats of arms of princely persons, paintings and drawings and an ensemble of lavishly illustrated 'natural history' pages which are strikingly meticulous, delicate and elegant. The Hauck collection will be auctioned at Christie's, in New York, June 27th and 28th.